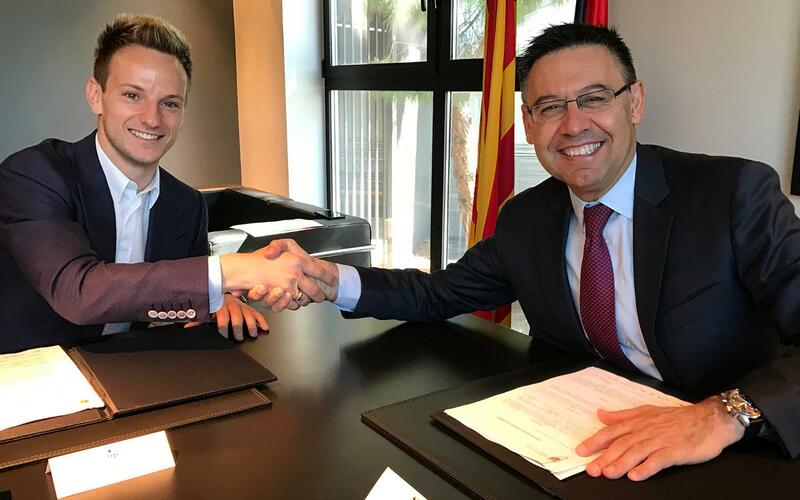 Ivan Rakitichas signed a new contract with FC Barcelona that will keep him at the Club until 30 June 2021. After the agreement was announced on Thursday, the Croatian midfielder appeared at the Club's offices on Friday to put pen-to-paper on his new deal, joined by president Josep Maria Bartomeu. Rakitic came to FC Barcelona in the summer of 2014 from Sevilla, and immediately became a fundamental part of the team’s success. In his two-and-a-half seasons with Barça, he has won eight titles out of ten possible: two Leagues, one Champions League, two Copas del Rey, one European Super Cup, one Spanish Super Cup, and one Club World Cup. Overall, he has made 145 appearances and has scored 23 goals. Coincidentally, Rakitic has signed his contract extension on his 29th birthday, just two days after having played a big role in Barça’s historic comeback against PSG that secured a berth in the Champions League quarter-finals.